Let me start by stipulating that by “leisure boules” I mean the kind of inexpensive “no name” boules manufactured in China that are available from many different vendors, including Petanque America. I do not include in that category Obut’s line of loisir inox boules (see below). Some of the differences are obvious. Competition boules come in a variety of sizes, weights, and striation patterns. That means that you can pick what suits you best. Leisure boules are basically a “one size fits all” affair. Another obvious difference is price. Leisure boules are much cheaper than competition boules. Today a set of three Chinese leisure boules will cost you about $20. In comparison, you will pay between $90 and $120 for the least expensive competition boules from La Franc or Obut. There are also differences that you can’t see. Leisure boules are made of much thinner steel than competition boules. 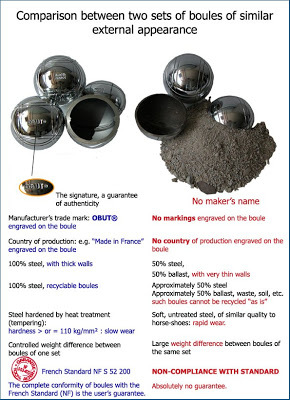 Because there is less steel in a leisure boule, the manufacturer brings the boule up to proper weight by filling it with something, usually a sandy kind of mortar. That means that while competition boules are always hollow, leisure boules are always filled with something. Boules are made by welding two steel hemispheres together. If the weld cracks, water can get into the crack and start to rust. Eventually rust weakens the weld to the point that the boule breaks neatly in half along the weld. This can happen even to a competition boule, but it is more likely to happen to a leisure boule where the quality of the welding is poorer and the thinner shell flexes more. This does NOT mean that leisure boules are junk and that you should never purchase a leisure boule. Quite the contrary. Leisure boules are perfectly acceptable for casual or occasional play. And because they are relatively cheap, they are the best choice for someone just starting to learn and play petanque. 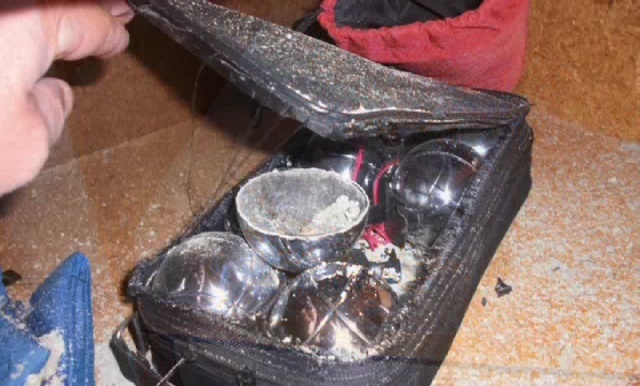 One consequences of filling leisure boules with sand is that— very rarely— they explode. It happened in 2016 in Germany, and in 2009 in Switzerland. 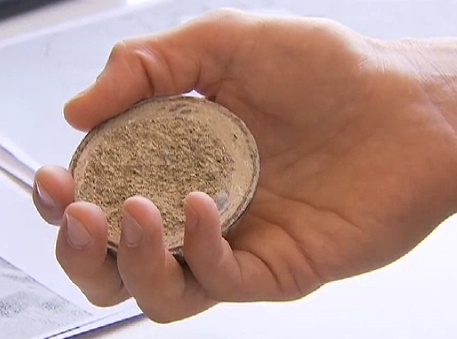 When the Swiss studied the boules, it was discovered that the boules were filled with damp sand contaminated with iron filings. The water in the sand corroded the iron filings, producing hydrogen gas. Under the pressure of the hydrogen gas, the poorly-welded seam of one of the boules failed and the boule exploded. It literally blew its top. For more information on exploding leisure boules, see THIS.